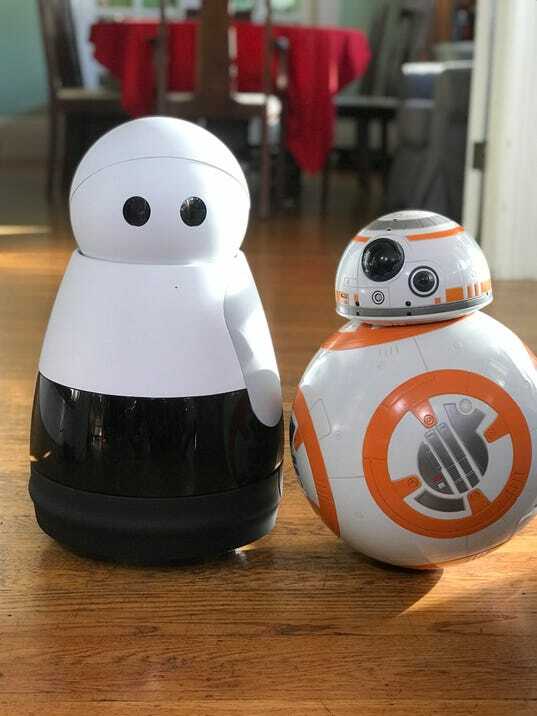 Columnist Jennifer Jolly runs through her favorite crazy technology devices and futuristic gifts of the year. It’s that time of year again—time to pay homage to the wackiest, most wonderful tech gadgets around. As you might know by now, I’m a huge fan of “unique” gifts. Lucky for all of us who appreciate the stranger things (and the Stranger Things) this year, the cup runneth over. So, off we go. This one looks like a mini-Kuri. Or a cyclops cyborg eyeball. The newest Samsung Gear 360 camera ($229.99) captures whatever is happening in 360 degrees of 4K high definition. This is the camera to bring when you are jumping out of a plane or doing anything similarly wild. Just hold it and let it record the moment. Or broadcast live to Facebook or even Gear VR. It’s light and easy to hold or you can pop it into a tripod and let it capture crowd or event footage. Leave regular gifts to the mouth breathers. The Stranger Things Alphabet Wall ($85) comes courtesy of TheAltarEgos on Etsy. Customize it with solid or colored lights. Hang it on your door, wall or cubicle. Then, Leggo my Eggo…purse. The waffl-box-inspired crossbody bag ($32.90) can hold as many strange things and D&D figures as you want. If that doesn’t quite do it for you, polish-up your fandom with the Stranger Things water slide nail decals ($3.50). Nailed it. ThinkGeek serves up all kinds of wacky-wonderful gifts, and they’ve outdone themselves with Star Wars merchandise this year, starting with the breakfast of Jedi champions: R2-D2 French Press (29.99), Death Star Waffle Maker ($39.99), BB-8 Heat Change Mug ($12.99), and Star Wars Snack Bowls ($16.99). After that, you can take your Star Wars Hero Droid R/C BB-8 ($229.99) for a stroll while wearing your Star Wars Ugly Holiday Sweaters (start at $24.99) and Darth Vader Slippers ($15.99). Turns out the answer to Rey’s “Where do you come from?” was ThinkGeek all along. Everybody keeps asking me which smartphone to buy. If you want a phone that’s as unique as you are, check out the ZTE Axon M ($725). A lot of phone makers are going for slick and thin but this one takes another approach: two screens primed for multi-tasking magic. Unfold it and you have a dual screen phone that will let you do different things on each screen. Watch a movie on one, chat friends about the movie on the other. Your geek friends will think it’s a newfangled Nintendo 3DS. Prefer strong to strange? Moto Z2 Force Edition ($720) is nearly indestructible, so much so that Motorola guarantees it won’t crack or shatter. It’s also Transformer-cool with its array of Moto Mods that can instantly morph it into a 360° camera, gaming console, powerful stereo speaker, video projector, battery powerhouse, and more. The new Mod Speaker with Amazon Alexa ($149.99) hears and responds to requests to play music, get news, answer questions and more. Whether you’re across the room or on the go, the speaker’s four powerful microphones make sure Alexa always hears you. I actually had my mom convinced the Kingston Bolt (starts at $59.99) was a high tech toothpick. She’s not naive, it’s just that tiny. (And she’s seen the wacky stuff I review, so really nothing surprises her anymore.) The Bolt is basically a flash drive for your iPhone or iPad. Just plug it into the lighting jack, download the Bolt app, and then back up your camera roll to the expanded memory. You can even shoot new pictures and videos directly to the Bolt. Not impressed yet? Consider this: The 128GB Bolt holds 32,000 photos. Mind blown. Sure, it looks like a pet rock, but the Bullguard by Dojo ($199.99) is actually rock-solid security for your WiFi connected world. It protects your entire WiFi network and everything using it, such as your laptop, tablet, smart lights, thermostats, baby monitors, and more. So if this past year of high-profile cyber snafu’s made you feel like you needed to hire a live-in security expert to keep out hackers, consider it done. Best part? It does not charge by the hour. Alright, I’m just going to say it: the leather PortoVino Wine Purse ($74.95) is one of the best gadgets of this entire year. It looks like any ole’ tote bag, but you can actually carry two full bottles of wine inside its insulated pouch, which will keep it cold and let you pour vino discreetly into your cup from the spout. Careful. You don’t want to be that mom at the Christmas play. But in all other circumstances? Necessary. Alternately, you could hide a nip in the Hello Blush Wine Bracelet ($44.99), which looks like a bangle. I’m giving most of these to someone on my list this year. If they don’t love it, they can re-gift right back to me, because these are just plain awesome. Jennifer Jolly is an Emmy Award-winning consumer tech contributor and host of USA TODAY’s digital video show TECH NOW. E-mail her at jj@techish.com. Follow her on Twitter @JenniferJolly. When horror works in VR, and when it doesn’t – AiPT!